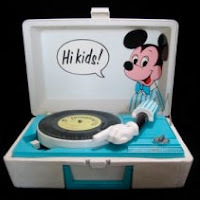 In the late 1970′s, when I was about 8 or 9 years old I had a crappy little Mickey Mouse record player. I am not using “Mickey Mouse” as a derogatory descriptive term here. It was literally a Mickey Mouse record player. I did a little Googling, and lo and behold, there it was. On this album were a number of genuinely great songs. You might doubt that a Muppet Show album could actually have truly great songs on it but I am telling you, this was the case. Of these songs, there were many I loved, especially Kermit’s "Lydia The Tattooed Lady", Scooter’s "Mr. Bassman" and the first (and certainly most uptempo) version of the jazz standard “Tenderly” I ever heard, as interpreted by members of Dr. Teeth and the Electric Mayhem. I remember playing all these songs and jumping up and down on my bed while singing along in Pigs In Space pajamas (I couldn’t find any images of these, but trust me, they existed). One of the quieter songs on The Muppet Show album was a musical interpretation of the nonsense poem “Halfway Down The Stairs”, by A.A. Milne. Until I started writing this blog, I had never taken the time to really research the poem or the song in general, let alone the Muppet version specifically. Imagine my surprise, then, when I discovered that the song “Halfway Down the Stairs” – the Muppet version - had reached the top ten in England in 1977, and the album The Muppet Show was a number one hit (also in the UK) – knocking The Beatles Live at the Hollywood Bowl off the #1 spot! As far as I had been concerned, this song was a rare b-side of an even rarer Muppet album. Only one person I’ve ever met (besides my brother) ever knew what I was talking about when I mentioned this album. But apparently a whole bunch of British people knew about it. Many years later, in the early 2000′s, when my daughter, Emma, was about one or two years old, we started a tradition where I would climb into bed with her, turn the light off, and sing her a “night-night song”. I tried all different sorts of songs, mostly pop songs like “California Dreamin’”, “Yesterday”, and a few others. One night, for reasons unknown, “Halfway Down The Stairs” popped into my head. Except that in my version it was “Halfway UP the Stairs”, as I couldn’t remember some of the lyrics. After that first time singing the song to her, there was no going back. “Halfway Down (Up) The Stairs” became THE night-night song. I tried to suggest alternatives, but Emma was not having it. It was decided. I have sung that song (with incorrect lyrics) hundreds of times. Although the song is a nonsense poem, over the years the words took on different meanings to me. When I quit drinking, the lines “I’m not at the bottom, I’m not at the top; so this is the stair where I always stop” took on a slightly more profound meaning, and one thinks differently of the phrase “Halfway Down the Stairs” in general once one has passed 40 years of age, I’ve found. The song followed us from Curious George to The Hunger Games, from Caillou to Dance Moms, from The Beauty and the Beast soundtrack to Adele. One night, shortly after Emma turned 13, she was going through the steps of getting ready for bed. I asked if she’d brushed her teeth, set her alarm – all the usual parental reminders. I followed her into her room, ready to proceed with our usual routine when she said, oh-so-casually, “It’s OK, Daddy, you don’t have to sing me a song tonight”. I let that sink in, then said “I don’t mind…”. She smiled at me and I could tell she was trying to be careful to not hurt my feelings. Emma has always been a naturally compassionate person, one of many qualities I love in her. “Nah, it’s OK” she said. And just like that, after 11 or 12 years of singing that song, a chapter had ended. I smiled and said “OK. You can change your mind if you ever want to, you know…”. “I know,” she said “but I’m not a baby anymore”. As I sat on the couch, afterwards, I thought of all the mini-graduations a parent witnesses. Each one a triumph and a marking of time. First words. Walking. Down the slide on her own. Graduating from the baby swing to the big-kid swing. Tricycle to training wheels, to two-wheeler. Times-tables. Taking the subway on her own. Each one an assurance that I’ve helped do my part as a parent to one day make her independent and self-sustaining. Working ever so hard to put myself out of a job. To help her not need me as much. To be smart, kind, confident and wonderful. Each another step on the stairs. And with each of these steps, another grey hair, a little more battered by life, a little older – hopefully a little wiser, too. Singing and music have been deeply ingrained into Emma. Literally within minutes of her birth, between the delivery room and taking her to be seen by various family members, I stood in a hallway with her, just the two of us, and sang “Happy Birthday” to her as tears rolled down my face. We sung while we got ready to go out when she was little, and there was a period from the time she was about 3-5 years old where we would dance and sing to disco songs in the morning as I prepared breakfast (looking back, probably as sure sign as any that Daddy was gay). And even now we sing along to music while we tidy up and do the dishes sometimes. Emma has a beautiful voice, and in addition to singing around the house, has also sung in a number of school talent shows and even spent a year in the Toronto Children’s Chorus before deciding it was making singing not as much fun anymore (at which point I agreed she should absolutely quit). Wow. What an incredibly touching story. Thanks for sharing, Chris.